Personalised mens polo shirt with bespoke custom embroidered text of your choice. AmysGifts can provide a text only shirt for the price shown with any text of your choice such as a name, initials, company name or a brief moto. 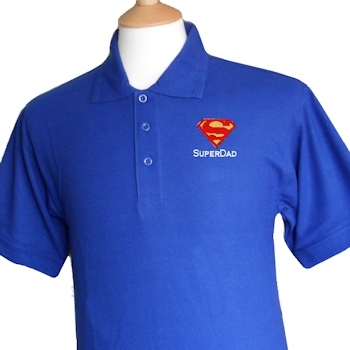 To add the superman logo as shown tick the add motif option, below the polo shirt image.